Dr. Kurt Luther is an assistant professor of computer science and, by courtesy, history at Virginia Tech, where he directs the Crowd Intelligence Lab. 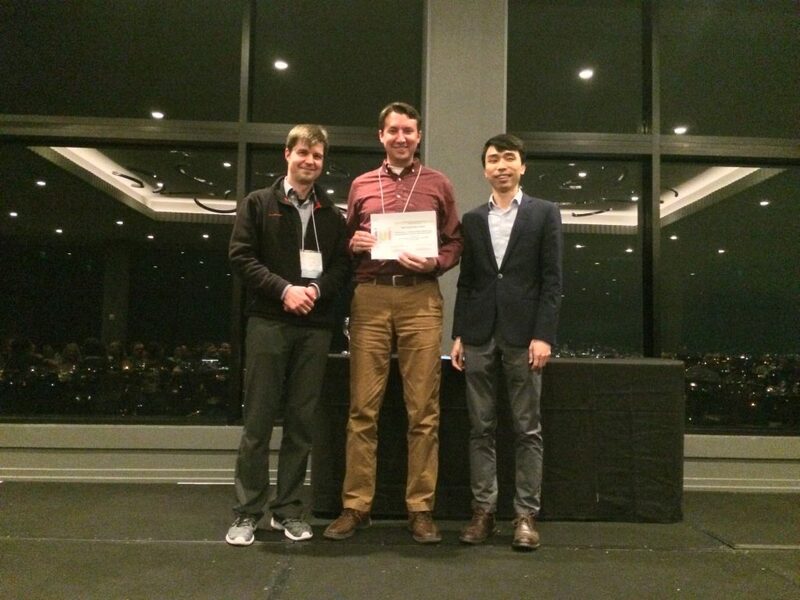 Dr. Kurt Luther (center) receives the IUI 2019 Best Paper Award from PC co-chairs Oliver Brdiczka (left) and Polo Chau (right). Photo courtesy John Wenskovitch. 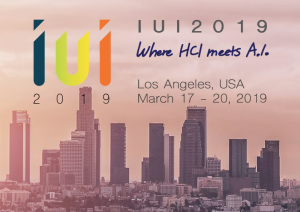 Our paper, “Photo Sleuth: Combining Human Expertise and Face Recognition to Identify Historical Portraits,” received the Best Paper Award at IUI 2019 in Los Angeles, CA. This award recognized the best paper among 282 submissions. Congratulations to lead author Vikram Mohanty (CS Ph.D. student), David Thames (CS undergraduate), and Sneha Mehta (CS Ph.D. student). Our paper, “Flud: a hybrid crowd-algorithm approach for visualizing biological networks,” was accepted to the CHI 2019 workshop titled, Where is the Human? Bridging the Gap Between AI and HCI, in Glasgow, Scotland. Congratulations to Crowd Lab co-authors Aditya Bharadwaj (Ph.D. student) and David Gwizdala (undergraduate researcher), as well as Yoonjin Kim and Aditya’s co-advisor, Dr. T.M. Murali. Investigators in domains such as journalism, military intelligence, and human rights advocacy frequently analyze photographs of questionable or unknown provenance. These photos can provide invaluable leads and evidence, but even experts must invest significant time in each analysis, with no guarantee of success. Crowdsourcing, with its affordances for scalability and parallelization, has great potential to augment expert performance, but little is known about how crowds might fit into photo analysts’ complex workflows. 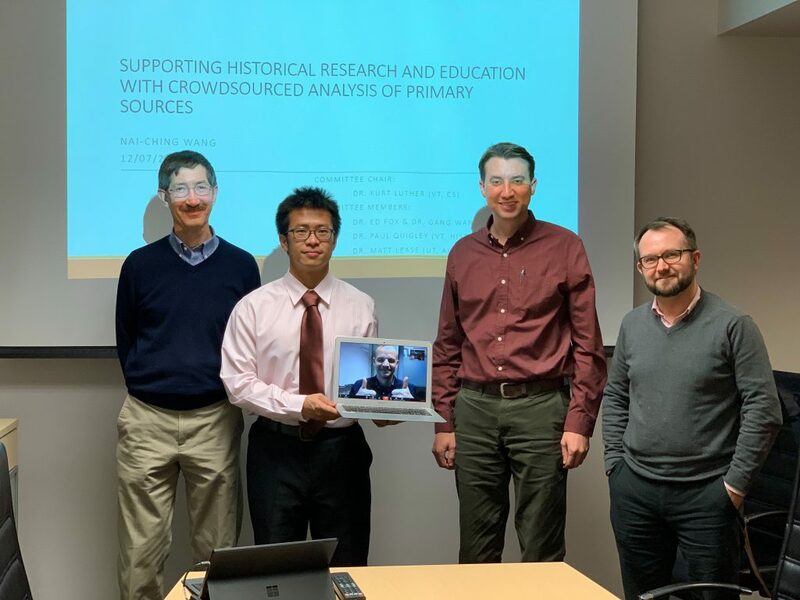 In this talk, I present my group’s research with two communities: open-source investigators who geolocate and verify social media photos, and antiquarians who identify unknown persons in 19th-century portrait photography. Informed by qualitative studies of current practice, we developed a novel approach, expert-led crowdsourcing, that combines the complementary strengths of experts and crowds to solve photo mysteries. We built two software tools based on this approach, GroundTruth and Photo Sleuth, and evaluated them with real experts. I conclude by discussing some broader takeaways for crowdsourced investigations, sensemaking, and image analysis. Dr. Luther is the lead guest editor for an upcoming special issue of the journal ACM Transactions on Social Computing. 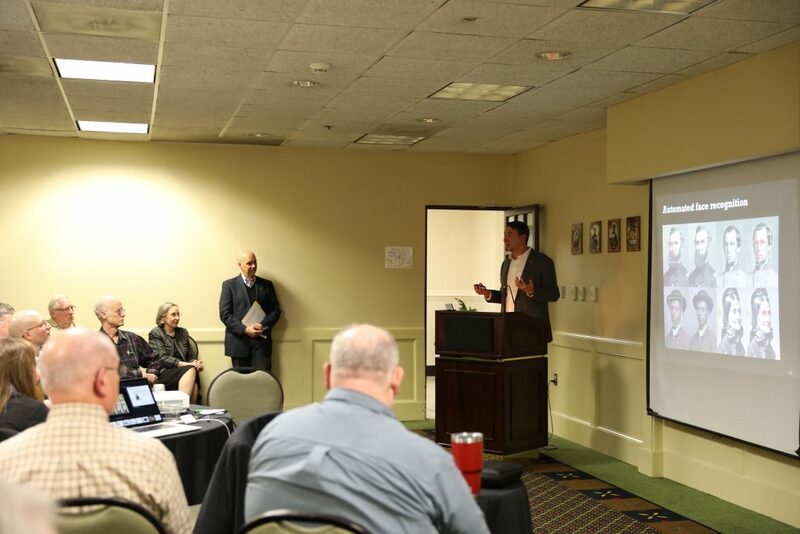 The theme of the special issue, “Negotiating Truth and Trust in Socio-Technical Systems“, emerged from the Designing Socio-Technical Systems of Truth workshop that Dr. Luther led at Virginia Tech in March 2018. The special issue co-editors are Crowd Lab postdoc Jacob Thebault-Spieker, Andrea Kavanaugh (Virginia Tech), and Judd Antin (AirBnb). Checklists and guidelines have played an increasingly important role in complex tasks ranging from the cockpit to the operating theater. Their role in creative tasks like design is less explored. In a needfinding study with expert web designers, we identified designers’ challenges in adhering to a checklist of design guidelines. We built Critter, which addressed these challenges with three components: Dynamic Checklists that progressively disclose guideline complexity with a self-pruning hierarchical view, AutoQA to automate common quality assurance checks, and guideline-specific feedback provided by a reviewer to highlight mistakes as they appear. In an observational study, we found that the more engaged a designer was with Critter, the fewer mistakes they made in following design guidelines. Designers rated the AutoQA and contextual feedback experience highly, and provided feedback on the tradeoffs of the hierarchical Dynamic Checklists. We additionally found that a majority of designers rated the AutoQA experience as excellent and felt that it increased the quality of their work. Finally, we discuss broader implications for supporting complex creative tasks. Two members of the Crowd Lab each had a paper accepted for presentation at the upcoming IUI 2019 conference in Los Angeles, CA. The acceptance rate for this conference, which focuses on the intersection of human-computer interaction and artificial intelligence, was 25%. Identifying people in historical photographs is important for preserving material culture, correcting the historical record, and creating economic value, but it is also a complex and challenging task. In this paper, we focus on identifying portraits of soldiers who participated in the American Civil War (1861- 65), the first widely-photographed conflict. Many thousands of these portraits survive, but only 10–20% are identified. 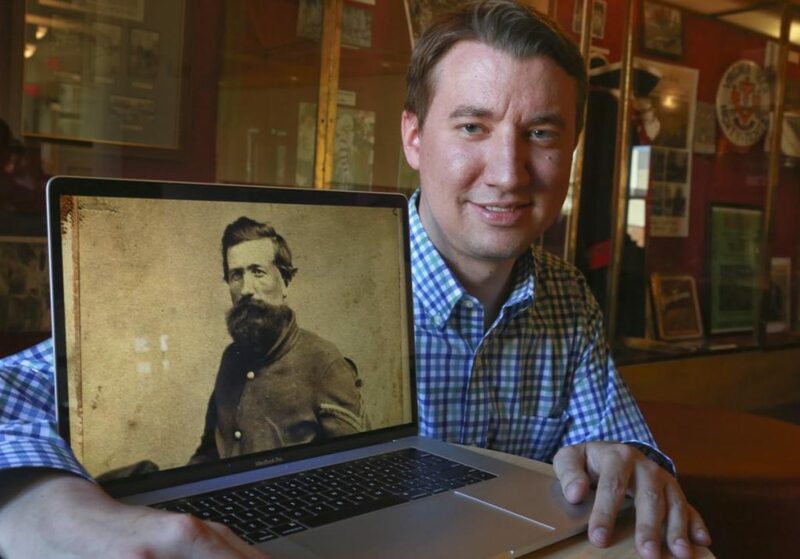 We created Photo Sleuth, a web-based platform that combines crowdsourced human expertise and automated face recognition to support Civil War portrait identification. Our mixed-methods evaluation of Photo Sleuth one month after its public launch showed that it helped users successfully identify unknown portraits and provided a sustainable model for volunteer contribution. We also discuss implications for crowd-AI interaction and person identification pipelines. Major breaches of sensitive company data, as for Facebook’s 50 million user accounts in 2018 or Equifax’s 143 million user accounts in 2017, are showing the limitations of reactive data security technologies. Companies and government organizations are turning to proactive data security technologies that secure sensitive data at source. However, data security analysts still face two fundamental challenges in data protection decisions: 1) the information overload from the growing number of data repositories and protection techniques to consider; 2) the optimization of protection plans given the current goals and available resources in the organization. In this work, we propose an intelligent user interface for security analysts that recommends what data to protect, visualizes simulated protection impact, and helps build protection plans. In a domain with limited access to expert users and practices, we elicited user requirements from security analysts in industry and modeled data risks based on architectural and conceptual attributes. Our preliminary evaluation suggests that the design improves the understanding and trust of the recommended protections and helps convert risk information in protection plans. Congratulations to Vikram, David, Sneha, Tianyi, and their collaborators!